A couple of Wesleyan kids make good. One of them wins tickets for a cruise. Does he greedily think: Hey, vacation time!? No. He says, wow, this is good production value. Let’s make a movie. And they did. With a pro-sumer Panasonic camera (and with the help of a friend of a friend knowing Nora Jones), these kids wound up with a fish out of water comedy that is doing quite well on the festival circuit and is pegged for an eventual DVD release. A kid is dating Nora Jones, but he is a slacker and she has had enough. She dumps him. So he takes a cruise to Jamaica. He is all alone, and tries to make the best of it. He’s a cool kid, he thinks, so when the ship arrives in Jamaica, rather than do the touristy thing, he meets up with locals, who, show him the place before stealing his money and clothing. He then misses the cruise ship as it takes off again and is forced to figure out a way home. He meets several people along the way, none better than a kid on a bike who offers to protect him. And that is the story. And that is what we follow during the film’s slim 70 minute running time. It is quite a good film with one caveat. It may be 70 minutes, but it feels like 170 minutes due to the films pacing, which I feel is a mix of intentional and unintentional. The film feels like a complete feature before he even gets off the cruise ship. But I can’t knock the movie simply for dragging. There is too much fun here. 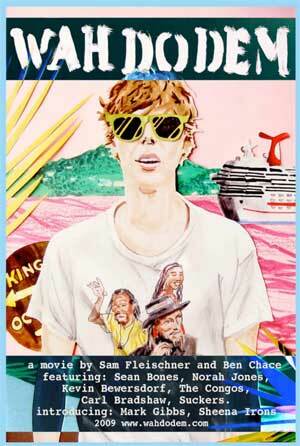 It is a great travelogue film. The low budget allows you to feel like you are part of the earth: you are here in the nitty and the gritty of Jamaica. There is some great humor, and some moments of truth. And the lead actor is fun, quirky, and a bit full of himself, but ready to be humbled. A great fun performance. It has humor, it has pathos, and it was made by kids just like us. So do check It out. This entry was posted on October 4, 2010 at 8:30 pm and is filed under Uncategorized. You can follow any responses to this entry through the RSS 2.0 feed. You can leave a response, or trackback from your own site.